SUBHEAD: There is only a handful of big tech winners - Amazon, Apple, Microsoft, Google Facebook & Netflix. Image above: Sign on an unidentified Amazon building. From original article. It won’t be long now. During the last 31 months the stock market mania has rapidly narrowed to just a handful of shooting stars. 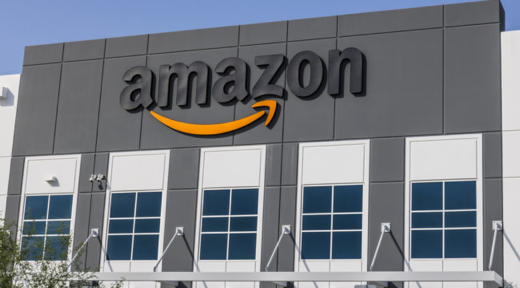 At the forefront has been Amazon.com, Inc., which saw its stock price double from $285 per share in January 2015 to $575 by October of that year. It then doubled again to about $1,000 in the 21 months since. By contrast, much of the stock market has remained in flat-earth land. For instance, those sections of the stock market that are tethered to the floundering real world economy have posted flat-lining earnings, or even sharp declines, as in the case of oil and gas. The degree to which the casino’s speculative mania has been concentrated in the FAANGs + M can also be seen by contrasting them with the other 494 stocks in the S&P 500. The market cap of the index as a whole rose from $17.7 trillion in January 2015 to some $21.2 trillion at present, meaning that the FAANGs + M account for about 40% of the entire gain. Stated differently, the market cap of the other 494 stocks rose from $16.0 trillion to $18.1 trillion during that 30-month period. That is, 13% versus the 82% gain of the six super-momentum stocks. Moreover, if this concentrated $1.4 trillion gain in a handful of stocks sounds familiar that’s because this rodeo has been held before. The Four Horseman of Tech (Microsoft, Dell, Cisco and Intel) at the turn of the century saw their market cap soar from $850 billion to $1.65 trillion or by 94% during the manic months before the dotcom peak. At the March 2000 peak, Microsoft’s PE multiple was 60X, Intel’s was 50X and Cisco’s hit 200X. Those nosebleed valuations were really not much different than Facebook today at 40X, Amazon at 190X and Netflix at 217X. The truth is, even great companies do not escape drastic over-valuation during the blow-off stage of bubble peaks. Accordingly, two years later the Four Horseman as a group had shed $1.25 trillion or 75% of their valuation. More importantly, this spectacular collapse was not due to a meltdown of their sales and profits. Like the FAANGs +M today, the Four Horseman were quasi-mature, big cap companies that never really stopped growing. Now I’m targeting the very highest-flyer of the present bubble cycle, Amazon. Just as the NASDAQ 100 doubled between October 1998 and October 1999, and then doubled again by March 2000, AMZN is in the midst of a similar speculative blow-off. Not to be forgotten, however, is that one year after the March 2000 peak the NASDAQ 100 was down by 70%, and it ultimately bottomed 82% lower in September 2002. I expect no less of a spectacular collapse in the case of this cycle’s equivalent shooting star. In fact, even as its stock price has tripled during the last 30 months, AMZN has experienced two sharp drawdowns of 28% and 12%, respectively. Both times it plunged to its 200-day moving average in a matter of a few weeks. A similar drawdown to its 200-day moving average today would result in a double-digit sell-off. But when — not if — the broad market plunges into a long overdue correction the ultimate drop will exceed that by many orders of magnitude. Amazon’s stock has now erupted to $1,000per share, meaning that its market cap is lodged in the financial thermosphere (highest earth atmosphere layer). Its implied PE multiple of 190X can only be described as blatantly absurd. After all, Amazon is 24 years-old, not a start-up. It hasn’t invented anything explosively new like the iPhone or personal computer. Instead, 91% of its sales involve sourcing, moving, storing and delivering goods. That’s a sector of the economy that has grown by just 2.2% annually in nominal dollars for the last decade, and for which there is no macroeconomic basis for an acceleration. Don't be drawn into the suckers rally: Listen to the guys who have beaten the market! Chris Mayer lays out eight unusual rules for becoming a better investor. In the report he reveals the five greatest investment books you have never heard of -- you get them immediately. Sign up for the Daily Reckoning today and receive your FREE report. Yes, AMZN is taking share by leaps and bounds. But that’s inherently a one-time gain that can’t be capitalized in perpetuity at 190X. And it’s a source of “growth” that is generating its own pushback as the stronger elements of the brick and mortar world belatedly pile on the e-commerce bandwagon. Wal-Mart’s e-commerce sales, for example, have exploded after its purchase of Jet.com last year — with sales rising by 63% in the most recent quarter. Moreover, Wal-Mart has finally figured out the free shipments game and has upped its e-commerce offering from 10 million to 50 million items just in the past year. Wal-Mart is also tapping for e-commerce fulfillment duty in its vast logistics system — including its 147 distribution centers, a fleet of 6,200 trucks and a global sourcing system which is second to none. In this context, even AMZN’s year-over-year sales growth of 22.6% in Q1 2017 doesn’t remotely validate the company’s bubblicious valuation — especially not when AMZN’s already razor thin profit margins are weakening, not expanding. Based on these basic realities, Jeff Bezos will never make up with volume what he is losing in margin on each and every shipment. The Amazon business model is fatally flawed. It’s only a matter of the precise catalyst that will trigger the realization in the casino that this is another case of the proverbial naked emperor. Needless to say, I do not think AMZN is a freakish outlier. It’s actually the lens through which the entire stock market should be viewed because the whole enchilada is now in the grips of a pure mania. Stated differently, the stock market is no longer a discounting mechanism nor even a weighing machine. It’s become a pure gambling hall. So Bezos’ e-commerce business strategy is that of a madman — one made mad by the fantastically false price signals emanating from a casino that has become utterly unhinged owing to 30 years of Bubble Finance policies at the Fed and its fellow central banks around the planet. Indeed, the chart below leaves nothing to the imagination. Since 2012, Amazon stock price has bounded upward in nearly exact lock-step with the massive balance sheet expansion of the world’s three major central banks. 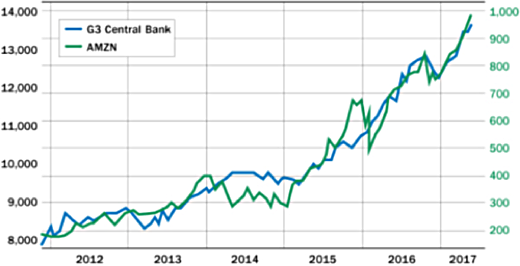 Image above: Comparison of stock values of G3 Central Banks and Amazon Corp. From original article. At the end of the day, the egregiously overvalued Amazon is the prime bubble stock of the current cycle. What the Fed has actually unleashed is not the healthy process of creative destruction that Amazon’s fanboys imagine. Instead, it embodies a rogue business model and reckless sales growth machine that is just one more example of destructive financial engineering, and still another proof that monetary central planning fuels economic decay, not prosperity. Amazon’s stock is also the ultimate case of an utterly unsustainable bubble. When the selling starts and the vast horde of momentum traders who have inflated it relentlessly in recent months make a bee line for the exits, the March 2000 dotcom crash will seem like a walk in the park. .